The Jonas brothers, perhaps one of the hottest groups when it comes to the tween/teen market, star in their own teen comedy series, Jonas - Keeping it real. Keeping it Real stars Kevin, Joe and Nick Jonas as Kevin, Joe and Nick Lucas, as brothers. It follows them at home (in a converted fire station, complete with poles to slide down) with their parents, brother and sister, also at school and other teenage hangout locations. Teen comedy series always have a few common elements - good clean humour, crazy escapades, pesky little brothers, love interests - Jonas brothers has it all. In the first episode, Wrong Song, Nick is crazy about a girl who is a fellow musician. Nick writes a song for her and after a misunderstanding, the girl uses the song in her act and dedicates it to another guy. As can be seen, the plot lines are simple fare, to be consumed by a younger audience. Expectedly, as the series progresses, each brother’s character develops and get their own storylines, for example, Kevin in finding a college. 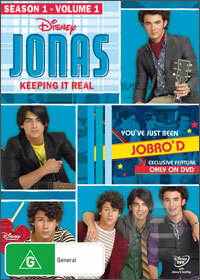 Spattered throughout each episode are Jonas brothers songs written especially for the series. These are enjoyable, cheesy pop songs which hark back to perhaps a much older series about a family band *wink*. It's not worth mentioning the adequate acting, the unbelievable plot, the cheesy jokes - that's what makes this so accessible to its intended viewers who don't care about these things and add to the fun factor. Adults may find these episodes a little too simple, the jokes a bit too childish but younger family members will get a lot of enjoyment out of watching this.